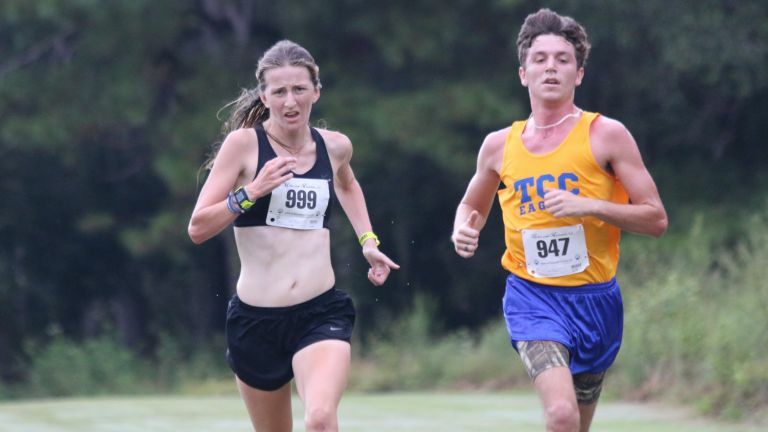 TALLAHASSEE, Fla. – Hours after the mad scramble to be cleared for competition by the compliance office, 15 members of the Florida State women’s cross country team dashed into action for the first time at Apalachee Regional Park Saturday morning. Competing in the open division at the Big Bend Championships, the Seminoles set the baseline for the season ahead with a host of strong performances, both by those in uniform, and several others who competed unattached while awaiting clearance. Junior Sarah Candiano was the first Nole in uniform across the finish line, placing sixth overall in the mixed gender 5,000-meter race in 18:43.46. She was joined in the top 10 by freshman Elizabeth Jenkins (9th, 18:53.93) and senior Forever Young (10th, 18:59.96), who broke both 20 and 19 minutes for the first time. In all, Seminoles nabbed eight of the top 21 spots. Junior Jessica Lonas (13th, 19:22.06), freshman Micaela Torres (15th, 19:38.60) and senior Bella Poole (16th, 19:58.62) rounded out the sub-20 performers on the day. Most notable among FSU students competing unattached, freshman Jodie Judd from Great Britain was the top female and fourth overall in the field 55, finishing in 18:06.98 on a muggy morning. A majority of the Noles competing will return to action on Sept. 23 at the Mountain Dew Invitational in Gainesville, then be able to comparably measure their progress from the opener at the Oct. 6 FSU Invitational.